As electric chainsaws go, the PowerNow CS1500 is as efficient as it is durable; lack of promotion in no way hints at a debilitation. This saw is ideal for homeowners looking to get yard work done properly or have need to clean up following a storm. It can fell branches and trees and has an ideal grip to help with tasks in general. It is also one of the more noiseless saws on the market, not to mention affordable. It is highly rated in most of the electric chain saw reviews due to its unique features, quality and affordable pricing. It’s tool-less tightening, auto-oiling, and auto-sharpening features save you time and plenty of effort; save that energy for the real work. Durability statistics are also quite elevated for the PowerNow CS1500; it can last you several years and work efficiently during that time. Its ergonomic design makes for a comfortable long-term chainsaw and it comes with safety features like an 18-inch reduced-kickback guide for the bar and chain. There await a plethora of benefits for a PowerNow CS1500 user. The saw weighs a total of 12 pounds; which is comparatively light for a power tool. Capable of using 15 amps of power, you can certainly expect some force from this tool; ideal for most yardwork and then some. It can cut wood that is 16 inches in diameter. If you take it slow, you can manage wood sizes slightly bigger as well. The 18-inch bar and chain are superbly efficient and sturdy. The most unique and original feature on the PowerNow CS1500 is its auto-sharpening feature. The sharpening occurs in less than 3 seconds. Equipped with an instant-start mechanism (via a trigger), you will find ample convenience working with the PowerNow CS1500. Not only is it remarkably silent between cuts, this chainsaw is silent in general. You can in fact hear people at a distance while still working with the saw on. It has a rather ergonomic design that enables easy hold and grip while working, especially for extended periods of time. The handle is over-molded for extra comfort. A translucent viewing window enables a quick look at the oil content in the internal reservoir for the same. In fact, the oiler is fully automatic and oils the chain on its own. A brake is integrated into the chain to make for speedy stops; this is quite a good safety feature. There is also an 18-inch kickback reduction component for the bar and chain; one more amazing safety feature. This being one of the honest electric chainsaw reviews, we will delve into its downsides too. As with most chainsaws in this category, you cannot push it to perform heavy-duty work. Gas powered chainsaws are a better bet in this regard. It does not have an auto-tightening feature affiliated with the bar and chain mechanism. It seems like one important feature has been replaced with another, namely the auto-sharpening feature. However, it does have a tool-less tensioner component that saves you time and effort during tightening. 1. 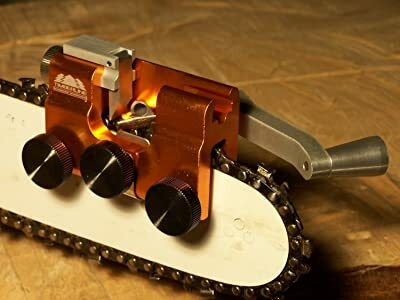 Auto-Sharpening – No other chainsaw in this sub-type and range enjoys this feature. This means you do not need to sharpen the chain separately, it does that on its own. The fact that it can stay sharp without any help from you means you can work extra hours and more efficiently without needing a break or stopping projects in the interim for no reason. As mentioned earlier, it takes at most three seconds to sharpen a dull blade; it detects when on its own. 2. Safety – Wear protective gloves (industrial grade, preferably) whenever you handle chainsaws, the PowerNow CS1500 being no exception to the rule. Flying debris and related problems demand the use of safety goggles. Fine dust could fly up into the air from certain sawing and cutting tasks. This warrants the use of a facemask or at least a handkerchief tied across the lower face. Your clothes too need to be tough without becoming a burden to your project; heavy clothes are not suggested but ones with tough material are. 3. Usage – As maintenance goes, this chainsaw demands very little. It automatically oils the blade, it automatically sharpens it, and it has a tool-free tensioner to help with bar and chain tightening. Add an ergonomic design and handle for enhanced grip and comfort and you have yourself a chainsaw that works like a charm and looks the part. You can put this chainsaw to several useful applications. 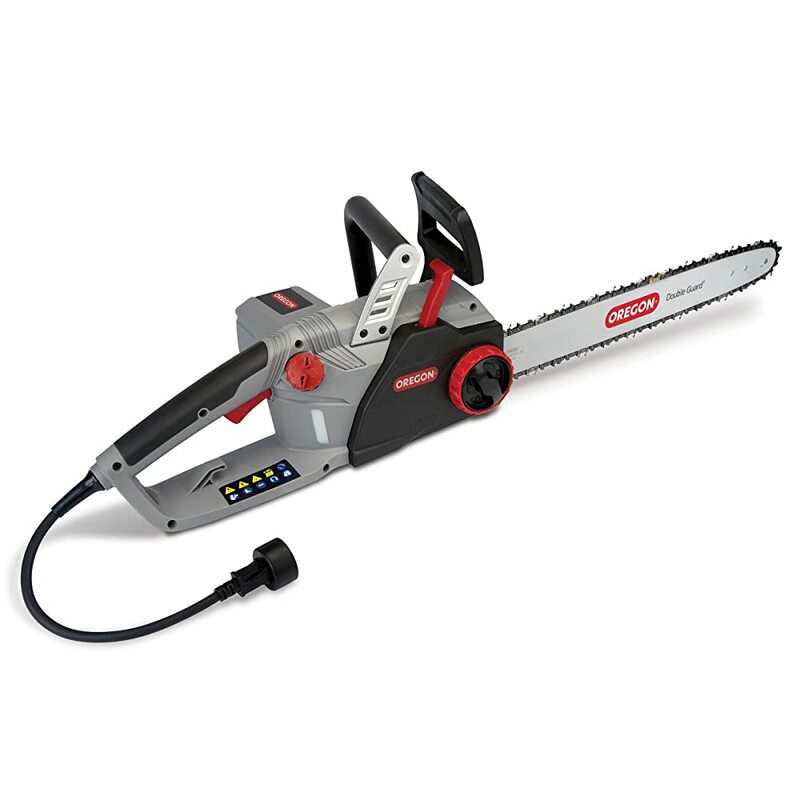 Whether it is cleaning up the yard after a storm has broken a tree or strewn overly long branches about or you need to cut firewood for use inside the house, most of the electric chain saw reviews recommend PowerNow CS1500 is the best choice. If you have yet to hear of this chainsaw, it is probably because it has not been as keenly marketed as others in its type and category. In case you have a barbecue planned or even a casual get-together or party around a bonfire, you can cut adequately sized branches in no time using this chainsaw. Even pre-adolescents will find it easy to learn and wield this product; it is that user-friendly, safe, and simple. The PowerNow CS1500 is ideal for varied cutting tasks spanning the light- to medium-duty spectrum. We highly recommend this electric chainsaw for light- to medium-duty cutting, cleaning, and sundry yard work.